Metsä Wood has started test runs on the new 65,000 cubic metre Kerto LVL line at the Punkaharju mill. The investment will increase the mill’s production of Kerto LVL by about 50 per cent. The installation phase of the investment project, launched at the beginning of 2018, was completed on schedule. The first products from the new line will be available for sale in April. In 2017 to 2018, Metsä Group made its largest investments in wood products. In addition to the Punkaharju mill, there was an investment in Kerto LVL in Lohja, where a new line was introduced a year and a half ago. 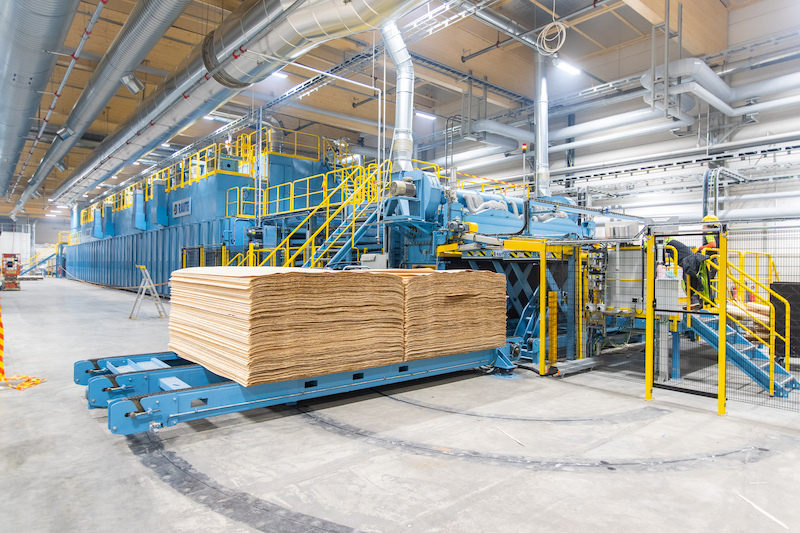 Since then, the Äänekoski birch veneer mill and the Pärnu birch plywood mill have also started operations. “In Metsä Group, Kerto LVL is seen as a product of the future worth investing in. The product has a global market where we can operate competitively,” said Metsä Group’s President and CEO Ilkka Hämälä. From the point of view of increasingly challenging climate targets, mechanically processed wood products play a very important role. In wood products, the most valuable parts of the wood – logs – are utilized in the best possible way, and they also store carbon for a long time. “Metsä Group’s product portfolio must include products that are processed from high-quality logs. The Punkaharju mill is one of the key processing plants in this respect. We also see that in industrial construction, Kerto LVL is a winning product that can gain market share from traditional steel and concrete. Using wood products in construction is an example of climate action,” Hämälä added. The production capacity of the new Punkaharju line is 65,000 cubic metres, and the value of the investment is 52 million euros. At the moment, there are some 500 people working at the Punkaharju Kerto and birch plywood mills, including all operations within the mill area. In January, 43 new employees were recruited to the mill, of which 35 were recruited through apprenticeship training. Most of the new employees come from the surrounding area, Savonlinna and Parikkala.